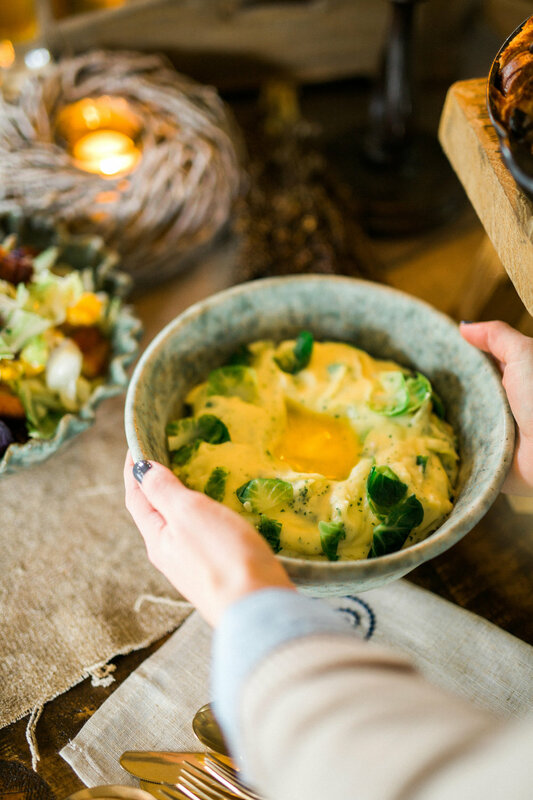 "Oh weren't them the happy days when troubles we knew not and our mother made colcannon in the little skillet pot" - Irish Folk Song "The Little Skillet Pot"
St. Patrick's Day is my favorite of the smaller holidays. And this beautiful Irish supper is exactly what I would envision should I have all of our friends over for a warm and a celebratory evening. 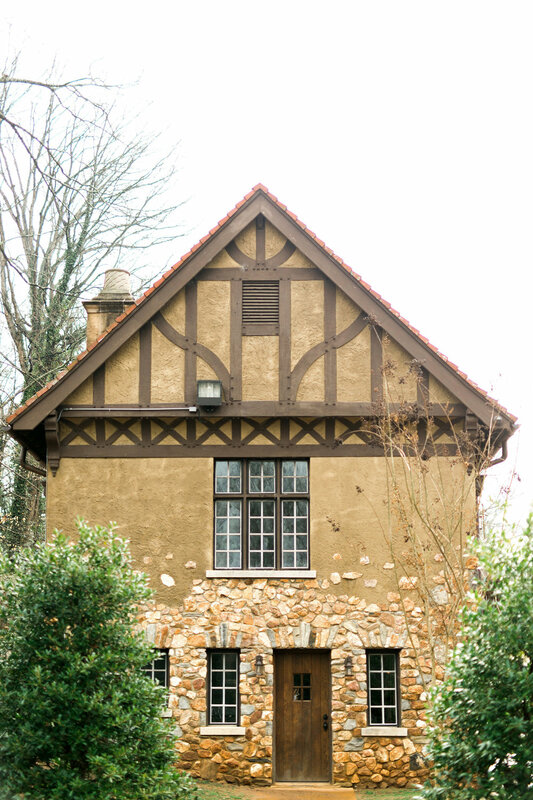 Tiffany of Rustic White Photography (also a contributor to The Captivated Issue!) worked with Natalia and Bart of Tailor & Table to create a beautiful evening with other artists. 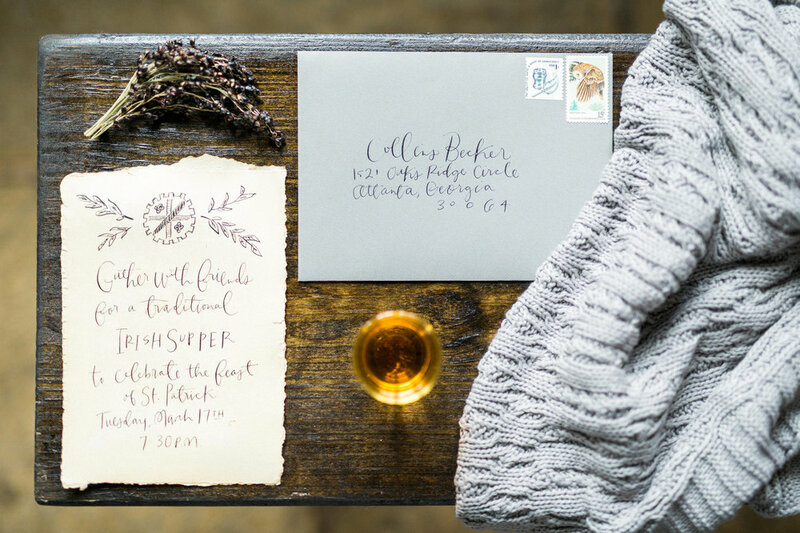 One of my favorite details, the St. Patrick's badge on the invitations—a beautiful and historic flourish to make the evening even more special. Read what Natalia and Bart of Tailor & Table who designed this evening had to share with us abd find the Bread Cream Pudding Recipe below! This is a casual gathering of close friends for a mid-week dinner party to celebrate the Feast of St. Patrick. 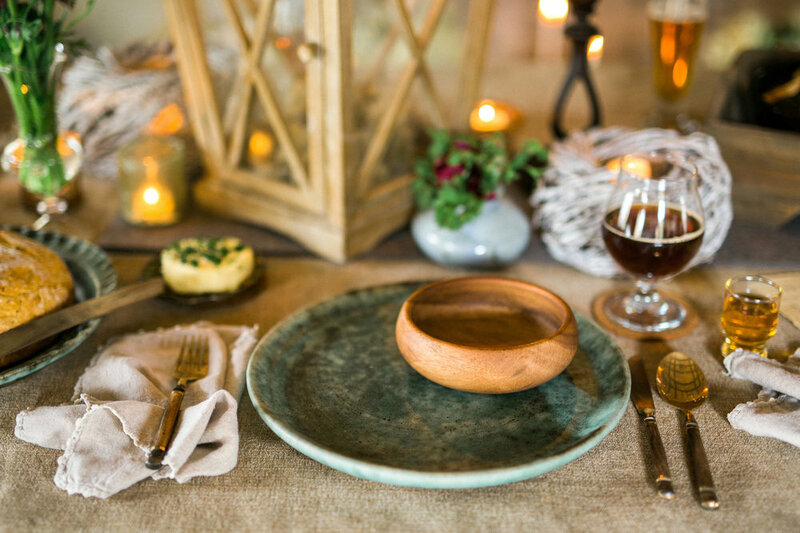 We really wanted the gathering to feel intimate, organic, and effortless - this isn't the type of dinner party with place cards, formal place settings, and complicated recipes. 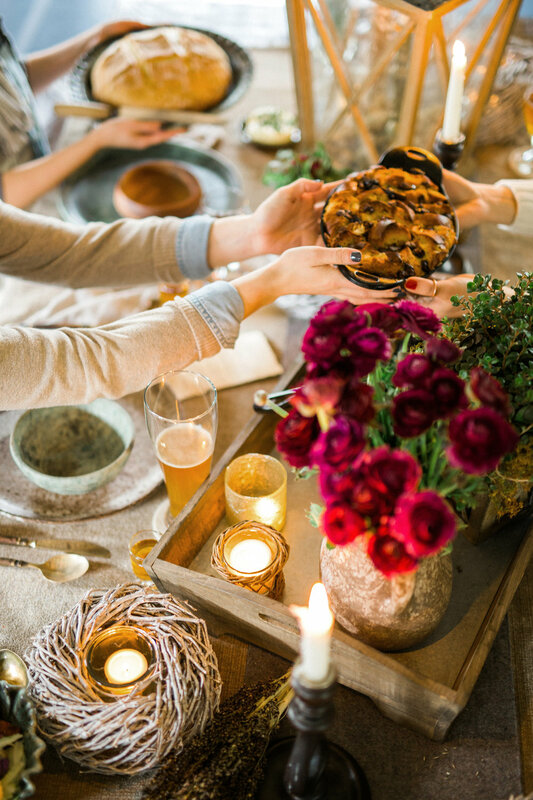 This is a gathering for friends that you feel so comfortable with, you don't feel any pressure for your house to be spotless upon their arrival (in fact, they're lucky if you do any extra cleaning at all!). There's no judgment or pressure in this group. Everyone is here to spend quality time together - laugh, eat, drink, share stories, etc. The menu shares the same sense of warmth and ease. It focuses on hearty and humble fare, with some Irish influences - Irish Beef Stew, Soda Bread with Sea Salt and Herbed Butter, Colcannon Potatoes with Brussels and Ham, Braised Cabbage and Cauliflower with Roasted Bacon, Irish Cream Bread Pudding. Everything is served family-style in cast iron, or a piece from an eclectic collection of handmade pottery. And tomorrow, we'll be sharing the recipe to the Irish Cream Bread Pudding. Beverages included a variety of beers and Irish whiskey (of course!). This gathering will likely go late into the night -- probably until the candles burn out! The photo of the beer and whiskey shot with the floating shamrock references the Irish tradition of "drowning the shamrock. " This takes place on St. Patrick's Day, when the shamrock that has been in the hat or lapel is removed and put unto the last drink of the evening. A toast is proposed and then, when the toast has been honored, the shamrock is taken from the bottom of the glass and thrown over the left shoulder. The invitation features a hand-drawn, stylized version of a traditional St. Patrick's Day badge. These were often crafted from paper and ribbon and worn pinned to one's lapel to celebrate St. Patrick's Day. While this practice died out in the 20th century, the reference gives the story a sense of history. 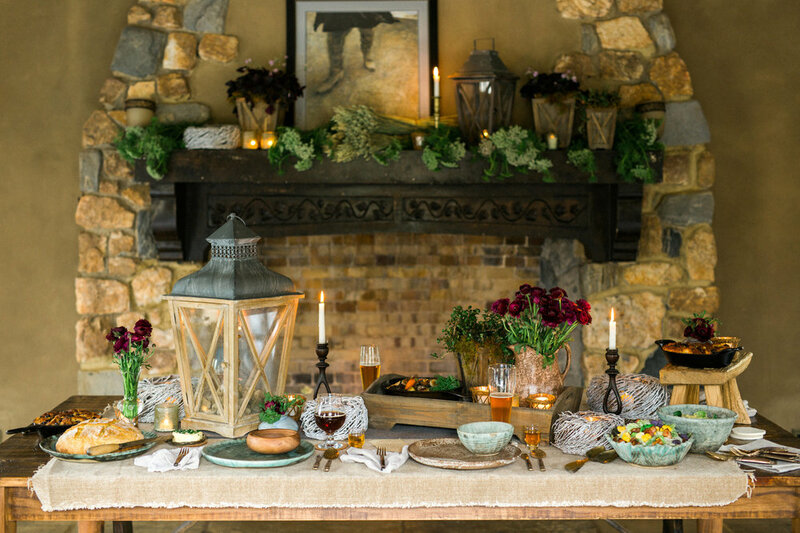 For our decoration materials, we really focused on incorporating wood, ceramic, brass, cast iron, stone, wicker, leather, cable knit, boiled wool, felt, and linen into the table to tell our story. Plant and flower types include ranunculus, green and purple shamrock, white crane kale, green mist, and seedum. We also incorporated various types of dried vegetation, including black sorghum stalk, avena oats, hooked barley, and phalaris. Generously butter a 2 to 3-quart casserole dish or 10 inch cast Iron Skillet. Mix heavy cream, half & half, and Bailey’s Irish Cream together in large bowl. Mix sugar and eggs together very well until the mixture is a pale yellow. Add Vanilla then combine sugar egg mixture to the cream mixture. Add cubed bread to custard mixture. Then fold in chocolate and cherries. Allow the bread to soak up the custard for about 20 minutes before you bake. Place the Bread Pudding mixture into casserole dish and place on middle rack of the pre­heated oven for 25­30 minutes. Check with a toothpick to assure the bread pudding is not too gooey. The top should be a nice golden brown. You can top it off with Irish Cream Liqueur. I recommend placing the liqueur in the fridge. This will create a nice contrast when serving the bread pudding warm. Serves 6.